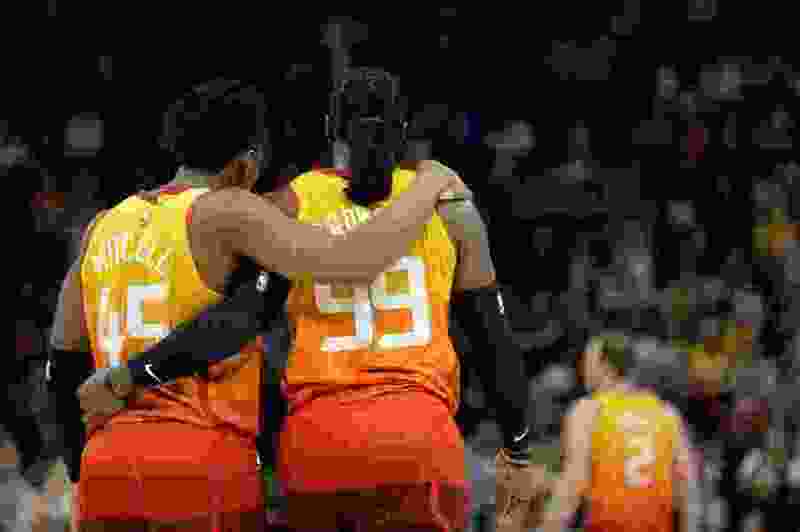 (Francisco Kjolseth | The Salt Lake Tribune) Utah Jazz guard Donovan Mitchell (45) and Utah Jazz forward Jae Crowder (99) celebrate their 100-94 win over the Pistons in their NBA game at Vivint Smart Home Arena Monday, Jan. 14, 2019, in Salt Lake City. “Next man up” is one of those cliches so trite as to elicit almost universal eye-rolling at its mere utterance, but these Utah Jazz — in the wake of simultaneous injuries to point guards Ricky Rubio, Dante Exum, and Raul Neto, plus forward Thabo Sefolosha — have been embracing it with enthusiasm. Yes, at its most basic, it means it’s incumbent upon the likes of Donovan Mitchell, Rudy Gobert, Joe Ingles, Kyle Korver, Royce O’Neale, et cetera, to do more to fill the void. The tricky part, coach Quin Snyder explained before Monday’s win over the Pistons, is that “more” in this case doesn’t simply entail, say, Mitchell doing more Mitchell things, or even just Mitchell doing some Rubio things, now that he’s serving as the de facto point guard. It must also include Ingles doing some Exum things, and Korver doing some Ingles things, and Georges Niang doing some Korver things, and Grayson Allen doing some Neto things. That trickle-down effect of players embracing unfamiliar roles and responsibilities has been paramount to the team’s four-game winning streak, the coach noted. Indeed, Mitchell has been front and center in terms of the expansion of responsibilities. He was recently named the Western Conference Player of the Week in part, of course, because he averaged 31.5 points per game in that span, but also because he utilized his court vision and bumped his assists per game up to 5.8 in that same stretch. Korver noted that while Mitchell is extremely talented, what he’s been tasked with is not the easiest of transitions. But then, Snyder pointed out, just about everybody is being tasked with doing something different right now. And just about everybody has found a way to contribute. Against the Lakers, yes, Mitchell had a career-high-tying nine assists. But O’Neale played nearly 40 minutes and knocked down a career-high five 3-pointers en route to a season-high 17 points. The next night against the Bulls, Gobert set a career-high with eight assists. And O’Neale added a career-high-tying 11 boards. And on Monday against Detroit, Ingles couldn’t really get his shot to fall, but he made the most of his playmaking opportunities, to the tune of eight assists. Snyder said it was important for the players to treat their present short-handed situation not with woe-is-me despair, but with a been-there-done-that demeanor. Korver is actually encouraging his teammates to treat the adversity as opportunity. Perhaps that’s why Utah’s own response to its present predicament has been so … well, cliche. About the Jazz • Even with a rash of injuries to the likes of Ricky Rubio, Dante Exum, Raul Neto, and Thabo Sefolosha, the team has won four straight games. … Utah has displayed a knack for comebacks of late, and is now 5-0 in the month of the January when trailing at the half. … The team has scored at least 100 points in nine consecutive games. About the Clippers • Los Angeles is coming off a 121-117 loss to NewOrleans on Monday, and has dropped three straight overall. … Tobias Harris is leading the team in both scoring (20.8) and rebounding (8.0). … L.A. gets a big contribution from its second unit, leading the NBA with 52.5 bench points per game.